You can choose to Export to Excel (instead of the PDF version) and/or Filter by your Active Tag. Or you can select the iPhone/iPad version. This report is useful only if you have a Location on your Organizations. So, be sure to do that prior to running this report. TouchPoint has an easy way to update multiple organizations using a spreadsheet. Go to Organization > Search/Manage and filter by selecting a Program (and Division and/or Schedule) and then click Search . Select from the blue Toolbar cloud icon Special Reports > Enrollment Control Report . Or you can select Special Reports > Enrollment Control iPhone/iPad . The iPhone/iPad version will open immediately in your browser. The following steps do not apply to this version. Click Run if you want the default PDF report. If you prefer the Excel version, select Export to Excel and then click Run . If you want the report for only those who are in the selected Program/Division/Schedule who are also in your Active Tag , select Filter by active tab and then click Run . This version of the report will present a list of buttons with all unique occurrences of the first two letters of anyone’s last name. The buttons are sorted in five columns with as many rows as needed. The sorting is down a column (like a phone book), not across a row. Only the combinations that will yield results are shown. Click the button to see the names, location, and class name. To return to the list of buttons, use the built-in back button in the browser. For Chrome, you just pull down on the page a bit to see the left arrow at the top. Printing copies of this report and having it available in key locations will help parents or staff to easily find a child’s classroom. After Promotion, parents may not remember their child’s new classroom. 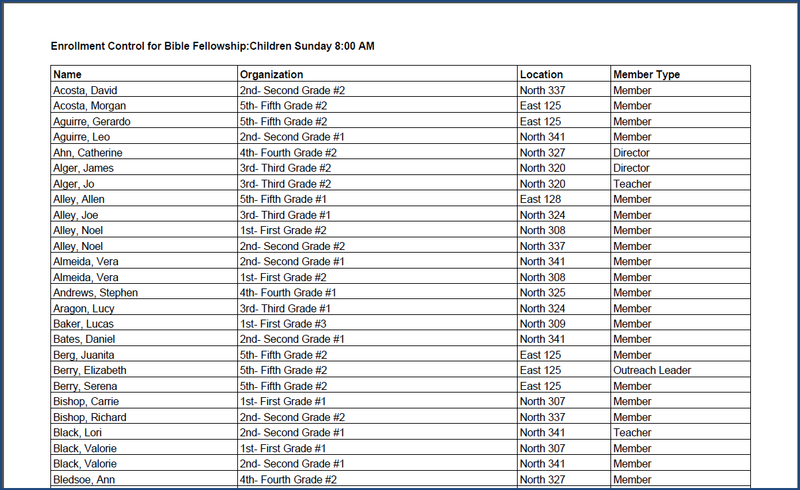 For an event like Vacation Bible School, parents may also not remember their child’s assigned class. This is also a good report for areas where you may not have a computer, iPhone or iPad available. Having a printed copy of children and their location may come in handy in an emergency when you need to find a person quickly. For VBS, we have a couple of busloads of children coming from our satellite campus. They are already enrolled in VBS and are in a Tag. The leaders can first make that Tag their Active Tag, and then run the Enrollment Control Report for the Program Vacation Bible School, selecting Filter by Active Tag and Export to Excel . They can sort the report by the Location and see at a glance which children go to the same classroom to make it easier for the leaders to get them where they need to go. Obviously, this will work for any reason you have a Tag of individuals and need to know at a glance their class and location. For the use case above, you can take it one step further and use the Excel export with a Word Merge and create nametags for those riding the bus. The export has their name, their class, and the location! This version serves the same purpose, to help people find out their classroom. However, with this version, any staff member with an iPhone or iPad can have this report on his device and help those who need to know their classroom. This keeps you from having to print a lot of copies of the standard PDF report, which will get outdated once new members are added. That is why this version is so helpful during VBS. You can be bookmark it and reopen it each day. Once you reopen it, you will see all the current members listed.